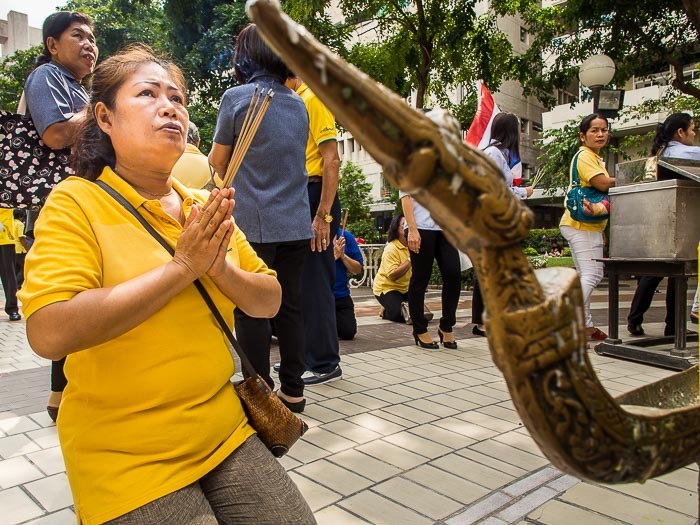 A woman prays for the King's health at Siriraj Hospital. Bhumibol Adulyadej, the King of Thailand, is hands down the most revered person in Thailand. The King was born on December 5, 1927, in Cambridge, Massachusetts. The family was in the United States because his father, Prince Mahidol, was studying Public Health at Harvard University. He has reigned since 1946 and is the world’s currently reigning longest serving monarch and the longest serving monarch in Thai history. He celebrates his 87th birthday Friday. A man makes an offering for the King. 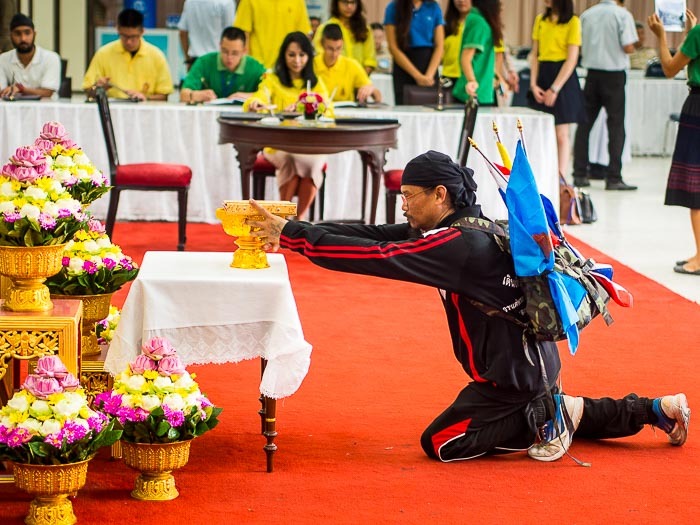 He said he walked to Siriraj Hospital from Korat, about 235 kilometers, to make an offering for the King. The King has been living at Siraraj Hospital since 2009. He left the hospital last year and has been living, under doctors' care, in the Royal family's "summer palace" in the seaside resort town of Hua Hin. 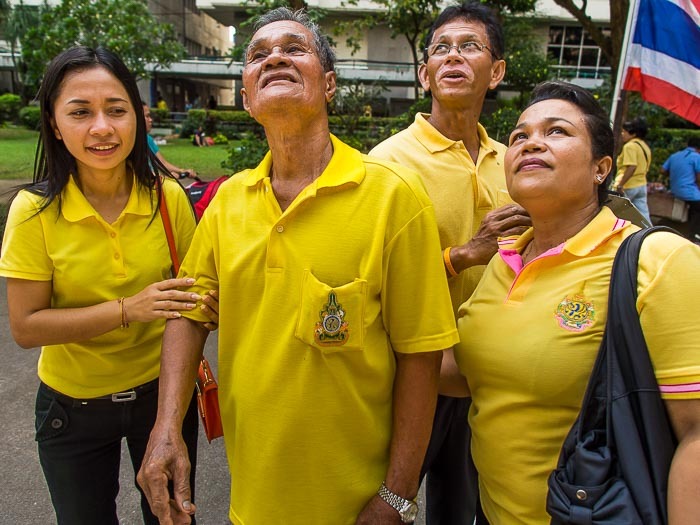 The King suffered a health setback in October and is back at Siriraj. A family looks up to the King's hospital room after praying for his recovery. Thousands of people come to the hospital every day to offer prayers and sign birthday greetings for the King. The crowds become bigger as his birthday draws closer. By the middle of next week there will be a sea of humanity at the hospital. 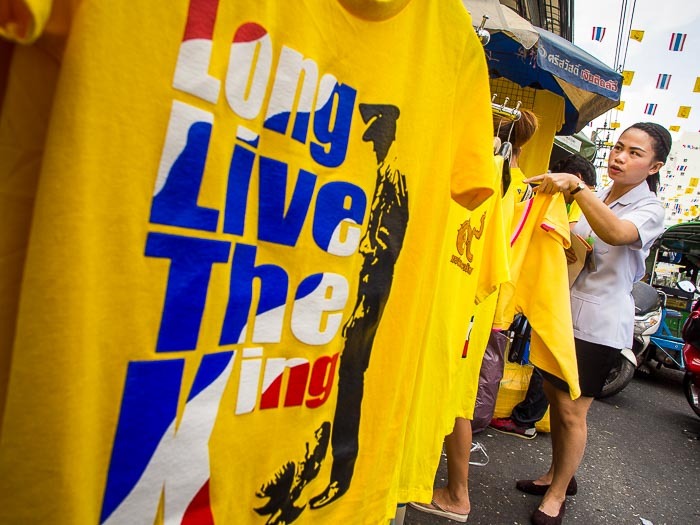 A woman looks for a yellow shirt to wear for the King's birthday. Vendors line the street in front of the hospital selling yellow shirts. There are more photos from Siriraj Hospital in my archive or available from ZUMA Press.